Need Bespoke or Custom Sizing? Our range of standard size banners are the best prices for standard sizes, but if you need custom sizes, whatever the size, we can help. They just cost a bit more. Do you need high-quality vinyl banners for your nursery, school, event, restaurant or just to grab some much-needed attention? We can definitely help. Over the last few years, we have printed banners for many customers such as; Brunel University, children’s nurseries, schools and large events. Banners are a great way to grab attention for restaurant openings, or sports events. Because we can produce banners at a great price, we have even printed banners for hen parties, birthdays, stag dos and other personal parties or events. A personalised banner with your friends face on is a great way to start a stag or hen party and is quite a talking point. 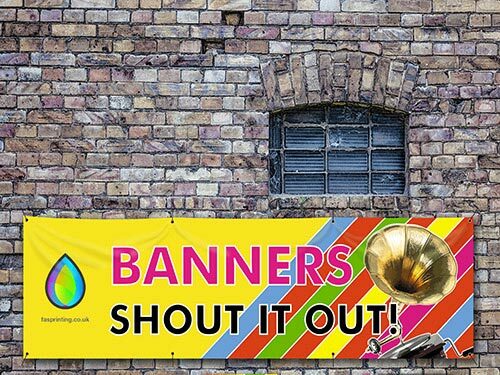 Our vinyl banner printing service makes use of the best quality materials available at an amazing price. The vinyl banner material is extra-tough and made to withstand interior and exterior use. They are printed in full-colour with fade-proof inks and can be finished with either hems and eyelets, hems only, trimmed to size, trimmed with eyelets or pole pockets. So no matter your need, we have the option to suit. We produce the standard banner sizes above, as they some of the most popular sizes of banners. This is done to keep costs down and speed up the production process. However, we also offer nearly any size you require, with many finish options. Finish options are dependent on how you want to secure a banner in place. Most common is hemmed with eyelets. The hem strengthens the banner and the eyelets are metal rings around a hole, that can be used to fasten the banner in place. We can also make banners with pole pockets – a loop at the top and bottom for hanging the banner similar to a flag. *hems and eyelets, hems only, trimmed to size, trimmed with eyelets or pole pockets. The standard for banners. Hemmed edges and eyelets (holes) for attaching the banner in place. This is great for hanging backdrops, as there is a sewn sleeve for a pole. This is a non-standard option, only available on our custom banners. The banner is trimmed to size, with no other finishing. This is a non-standard option, only available on our custom banners.